Life can throw you curveballs whether its a work function or an impromptu trip with the gals. 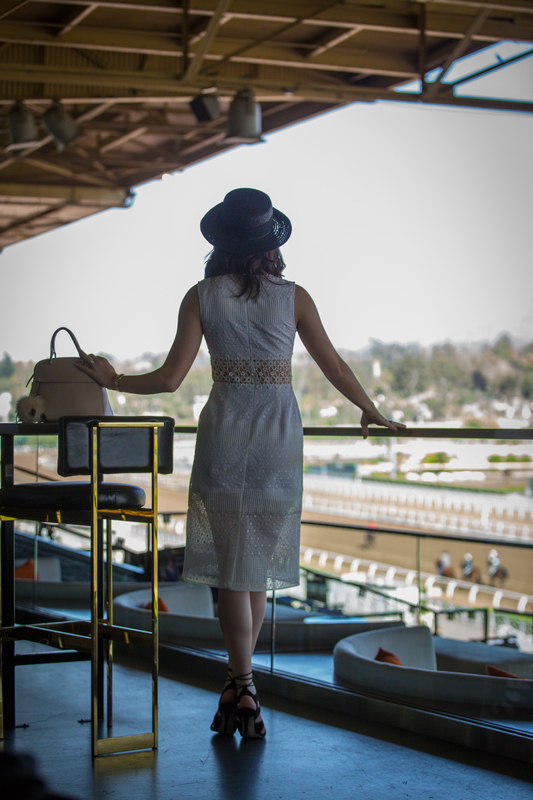 A day at the races can be planned for over a year, like the bucket list trip to the Kentucky Derby or you can just have a couple days notice before taking off to a raceday this upcoming Saturday! That is the case for me this weekend at Santa Anita Park. I will be taking off in just two days (I’m writing this on Wednesday ) for the Santa Anita Derby on Saturday. So what’s a girl to do?? Well…do what we do best. SCRAMBLE! I already did some ‘online window shopping’ yesterday but it is hard for me to drop $300 on a dress that I had 5 minutes to decide on. I decided to close the browser window, save on the overnight shipping, and shop my own closet. I know we always say “I have nothing to wear” while standing in a closet full of clothes. I am not here to tell you that feeling isn’t justified- I have it all the time! However, when you have to scramble, you’ve got to shake that phrase off your shoulders and start digging deep. Borrow from a girlfriend- always a good option especially if you’ve got stylish friends. Grab a racing outfit you’ve worn before and recycle! The chances of someone really saying- “Seriously? You’re wearing that again?” are slim to none. Put together a new outfit using a dress you haven’t worn often or pairing some fun pieces together. I’ve decided to go with option number 3! I remembered that I purchased a dress for my Romantic Valentine’s Day with my beau and I haven’t worn it to the races or really anywhere else. It is a bright red (very FATR) off the shoulder mid sleeve number from one of my favorite brands Keepsake. Be sure to check the weather! Especially during the Spring months, you never know if you are going to get an 80 degree day or a 50 degree windy disaster. I’m currently looking at 65 degrees this weekend in California which fits my dress perfectly. I already have a pair of red heels that I’ve worn to the Kentucky Derby a couple years back. They are comfortable and classic- can’t go wrong with these BCBG pumps. Email me! You’d be amazed how quickly I can get you a piece perfect for your dress. Grab one you’ve already worn. If you are crafty and motivated (two things I lack frequently) you can make a simple headband piece. Simple boater. 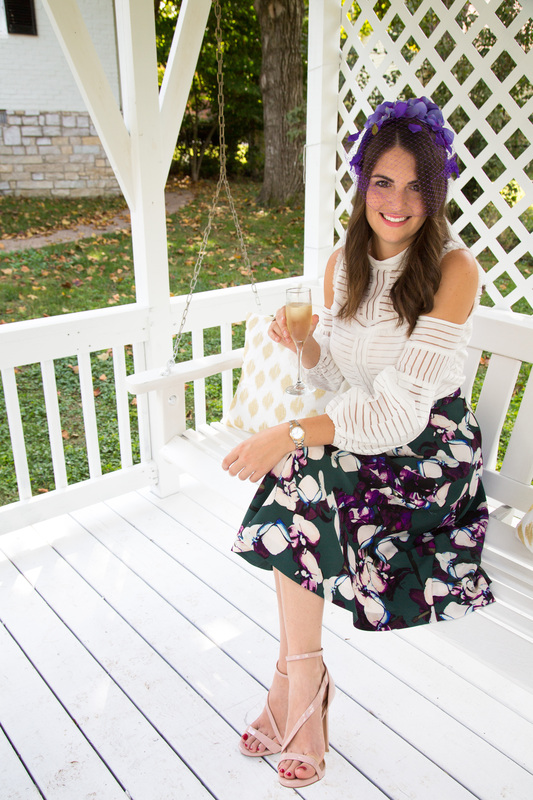 A neutral boater is the perfect hat to have for occasions like this. I have a black one that I used last minute the previous trip to Santa Anita. The best thing about a piece like this is you can add accessories to it so that it ties in better to your outfit. ie ribbons, or pom poms (very big right now) or a broach can be an easy fix. Borrow a friends- always an option if they are willing to lend it! I am working on getting a quick piece that I’m really excited about wearing…if I can’t swing that, I have a fascinator I can wear that I’ve worn before. Fashionable gals recycle don’t ya know?! Purchased dress on Asos (2 day shipping to my hotel-risky, I know). Paired with a go-to pair of Steve Madden heels I already had and a simple black boater. 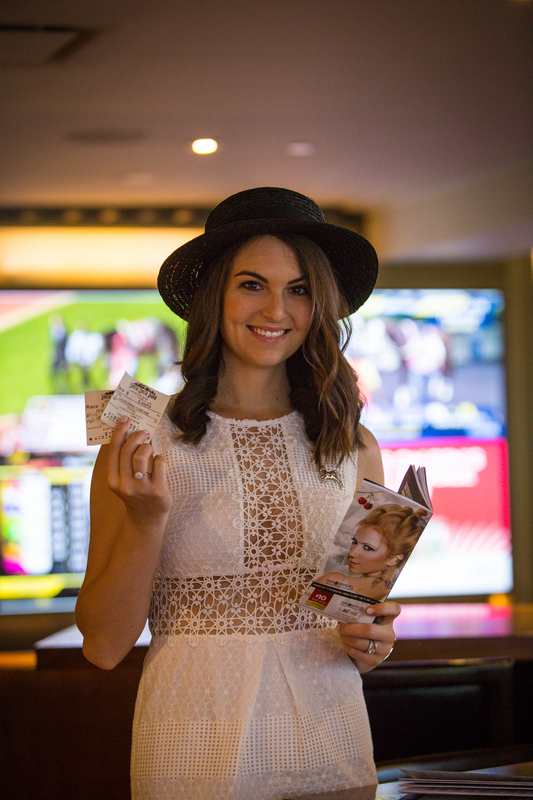 It wasn’t a big stakes day so this was a good outfit for the occasion. Pieced this one together from my closet using a blouse borrowed from a girlfriend (from Nasty Gal) and a Banana Republic Skirt that I frequent to work. Paired with a fascinator I had designed by Sophie Hunter and a pair of blush pink heels that I purchased for Oaks last year. The outfit worked for a last minute raceday piece and really had a nice vintage/classic feel to it!